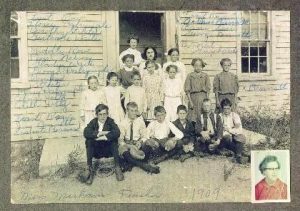 I teach in a classroom in 2012 that’s not all that different from the one my grandmother taught in almost 100 years ago. 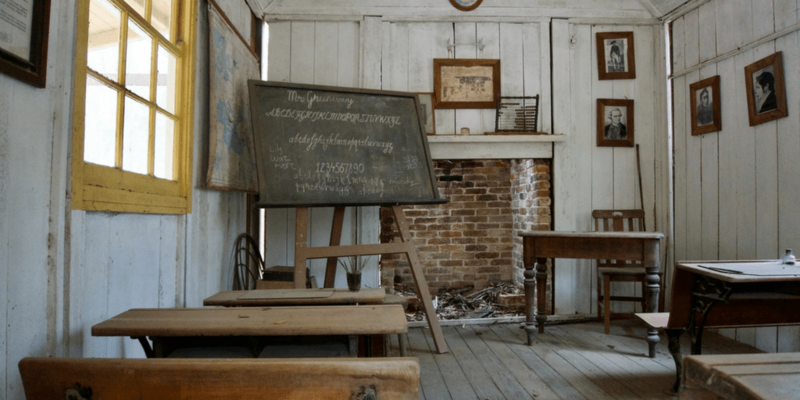 She taught her lessons in a one-room schoolhouse equipped with slate boards, not quite enough chalk, and uncomfortable seating. The room I work in has chalkboards, not quite enough chalk, and uncomfortable seating. I do not have to fire up a wood stove in the morning the way she did, but my room is always either too hot or too cold. My grandmother had a radio to sort of bring the world into the classroom. I have a TV monitor with a DVD player and a projector connected to a sound system. My grandmother told me that she only played the radio in class to provide atmosphere. I do the same thing with the songs I’ve stored on my Apple computer — only less effectively because at least the radio in my grandmother’s classroom provided an ever-changing mix of music punctuated by talk from somewhere far away. I have never played a DVD in class. I do not have Internet access in my classroom — or if I do, it’s just too complicated to figure out how to connect to it. My grandmother did not need to think about such things. In both of our rooms, almost 100 years apart, an amazing assortment of people with the usual assortment of issues, ideas, dreams, and goals have gathered to work their way into the future. There is nothing different really in the work she did then and the work I do now. We are both teachers — which is to say the work she did and the work I do is a combination of dream weaving and storytelling mixed with community building and acts of pure magic. My grandmother’s magic trick was to get the farm kids in her class to believe they could do anything. I do exactly the same thing with kids who are not that different. Her students in 1909 felt invisible and powerless. So do mine in 2012. My grandmother did her trick with her heart alone. I use my heart as well, but I also have a few magical tools at my disposal to make it all seem dreamlike. Though our classrooms and students are similar, my grandmother never got to teach a group of students who had the world in their pocket without even knowing it was there. Pearl Sandy, my grandmother, would love that and so in her honor, I help my students unpack and unleash that power. 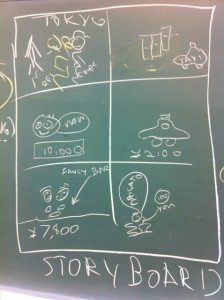 Recently, we have been working on telling stories in my classroom, making use of the blackboards, some paper, a lot of ideas, and each other. One day, when the room got a little too hot, we headed outdoors and told our stories under a shady tree. All of these activities so far are ones that I’m sure my grandmother did with her students. Here’s where things get very different. 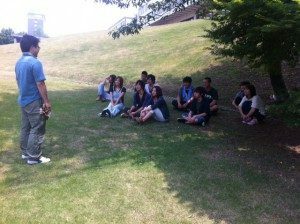 I gathered my students together and said “How many of you have a smart phone in your pocket?” Eighteen out of twenty-four had one that could record video. Six out of eighteen had enough battery and memory left to record videos of their classmates telling stories. We broke into six groups of four, with one filmmaker in each group. Then we videoed our stories and loaded them onto our private class Facebook page. Next week we’ll critique each other’s work before uploading our stories more publicly in a place where we can share widely and exchange stories with students around the world. That’s magic and it’s the real revolution. The question is not should we or shouldn’t we use technology. That’s a silly question. The real question is: how can we use the magic available to us to give voice to everyone and get the world connected in real and wonderful ways. The students in my grandmother’s class are now silent. My students never will be. 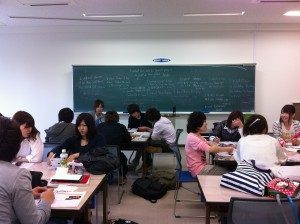 My students are not isolated in a room in the middle of nowhere. Their voices carry and will be heard everywhere. I know that Shiho won’t mind me sharing her story with you. It’s a dream. It’s coming true, and it’s getting better every day. Next articleFancy a new challenge?